Mirko Duvjak has served his country for over 41 years in the U.S. Army, Army Reserves, and the California Army National Guard, enlisting in June of 1975 as an E-1 Private. After serving as a Crew Chief on active duty he transferred to the USAR at Los Alamitos, where he was encouraged to apply for flight school. In 1983 he was commissioned as a Warrant Officer and currently has over 30 years of service as a Chief Warrant Officer, with over 3,800 accident-free flying hours in AH-1, AH-64, OH-58, UH-1, and UH-60 helicopters. Duvnjak is a school trained aviation safety officer (ASO). 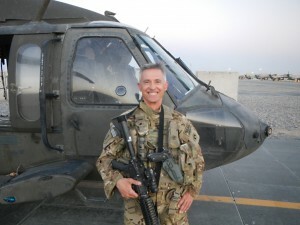 He is also currently work part-time as a maintenance test pilot on civilian UH-60 Black Hawks procured through the GSA auctions of former US Army UH-60s divested through the Black Hawk Exchange Sales Transaction (BEST) program. Mirko graduated from the Commercial Diving Center (then College of Oceaneering, then National Polytechnic College of Science) with a Professional Diver diploma, and has worked both diving and tending commercially in the Los Angeles and Long Beach harbor areas. He received special training in Marine Explosives from J.S. Brower & Associates and was Special Projects Director on a recovery attempt of a sunken transport ship (S.S. Islander) carrying approximately ten tons of Yukon gold which sank in Alaskan waters in 1901. He occasionally performs light commercial, recovery and research diving along the West Coast. Mirko Duvnjak received his Bachelor of Science degree in Physics from the California State University at Fullerton in 1988 and was a recipient of the Einstein House Scholarship for Chemistry from Cypress College. He privately tutors a wide variety of high school, junior college and university students. He speaks fluent Serbo-Croatian, able to read and write both the Latin (English) style and the Cyrillic (Slavic) style either printed or cursive. He has visited Bosnia and traveled throughout the country during Nov-Dec 1997. Visited Serbian, Moslem and Croatian territories. Have received foreign language proficiency pay (FLPP) based on Defense Language Proficiency Test (DLPT). Mr. Duvnjak’s present assignment with the California Army National Guard is Quality Control Section Chief, B Co. 640th ASB, JFTB Los Alamitos, CA. His civilian occupation is Maintenance Test Pilot (National Guard Technician).